Recycle your old newspapers and turn them into newspaper pots - perfect for sweet peas and other seedlings that can be planted straight into the ground. 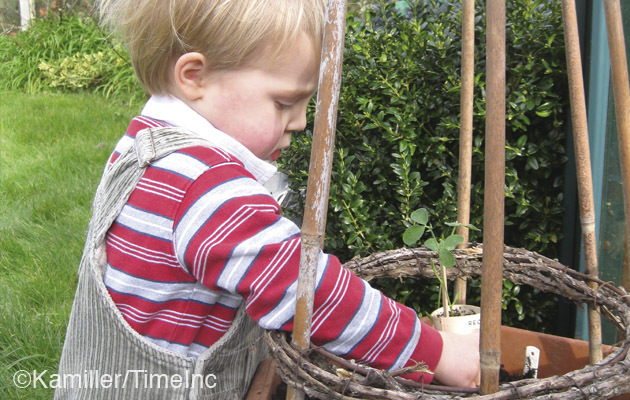 Keep the kids busy with these fun projects, says Katherine Miller. To make newspaper pots you’ll need a firm, cylinder-shaped container with a flat bottom; we used a thick kitchen roll tube, with modelling clay inside one end to make a level base. Roll newspaper around it. Fold the excess paper over at one end and press down firmly. Remove the tube and fill the paper pots with damp seed compost. We soaked sweet pea seeds overnight in warm water to soften the outer casing and set one seed in each newspaper pot. Leave on a windowsill until the seeds have germinated, after which they can be moved into a cold frame or greenhouse. Plant out seedlings in their paper pots after all risk of frost has passed. Pinch out the growing tip when two pairs of leaves have formed, to encourage bushy growth. When it’s time for our sweet peas to be planted out in their final positions, the seedlings can remain in their newspaper pots making them easy to handle without damaging the roots.